Kaisiki Natakam, a heart warming and intensely human tale, has gripped the imagination of commoners and kings down the centuries. In the Varaha Puranam, Lord Vishnu tells the story to Mahalakshmi about how he adores being worshipped through dance and music. 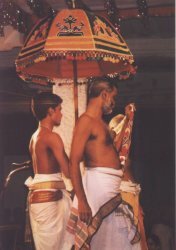 Kaisiki Natakam, which is traced back to the 13th Century, tells the story of a lowborn “Chandala” called Nambaduvan who devotes one night every year, on Kaisiki Ekadesi, to singing the praises of Nambi Perumal. On that day one year, he was traveling to the temple when a Rakshasa (demon) stops him and demands his flesh. 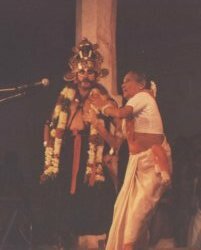 After great persuasion, Nambaduvan tells the Rakshasa that he would return to be eaten by him after completing his annual offering of music to Nambi Perumal. Convinced of the Chandala`s sincerity, the Rakshasa allows him to proceed to the temple. After singing all night in front of the Lord, Nambaduvan is on his way to the Rakshasa to fulfill his promise. At that time, Lord Vishnu himself, in the guise of an old man, stops him and asks him to take another route, warning him of a dangerous Rakshasa who eats all in his path. Nambaduvan refuses to break his promise and proceeds to meet his death. When the Rakshasa meets him again, his mood has changed. 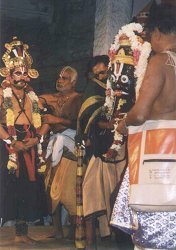 He now demands that Nambaduvan give over to him not his physical body but the Punyam (fruits of good deeds) he has acquired from his musical offerings to Nambi Perumal. Nambaduvan refuses and then is told that the Rakshasa is really a Brahmin who has attracted a curse because of his arrogance and who would be redeemed from the curse by a chandala. 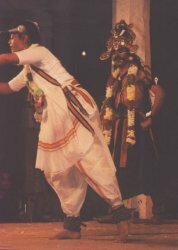 The story has an unusual element in that it points to the special place music and dance has in religious worship in temple societies of ancient times. The divisions of caste and class were blurred when it came to the purity of a devotee's intent. Similar to the practice connected with Vaikunta Ekadesi, devotees would fast and stay awake during the night of the Kaiska Ekadesi and listen to music and dance in praise of Nambi Perumal (the name given to Lord Vishnu in Thirukurungudi in Tirunelveli district of Tamilnadu). This was an act of great piety.